New title release: "Music Theory for Guitar: Video Lessons for Beginners"
This video-enhanced eBook is designed to be read in the iBooks 2 application on the iPad iOS 5. For readers new to iBooks, we’ve posted a quick tutorial to help you get started (see link at right). We are teaching “Music Theory for Guitar: Video Lessons for Beginners.” Some things are just easier when you can learn them from a live teacher. We are offering a “live teacher” video format, where you can stop, rewind and re-play as needed! We made this eBook with 65 minutes of video so that it can show-and-tell you about music theory for guitar playing. It has text, pictures, animations and video instruction, presented in a sequential learning format. Do you want to play a new song but the chords seem too complicated? Wondering what Cm maj7, Csus, Cdim, C9 mean? Wanting to move more comfortably between major and minor scales and chords? Wishing you knew more about moveable chords? Or that you could add the 7 or 9 to chords you already know? Ready to learn more of the terminology like Flat 7 or Major 7, Perfect Fifth, Major or Minor Third? Wishing you knew the root, third and fifth notes in the chords you play? Ready to improve your visual recognition of common intervals on the guitar fretboard (the Major Third, Perfect Fifth, the octave)? With 10 chapters of lessons and 13 videos, we present "Music Theory for Guitar: Video Lessons for Beginners." Hopefully we can teach you just enough music theory to help you figure out those next (more difficult) songs, to visualize notes and intervals on the fretboard, to be able to read chord names and to construct/deconstruct those chords on the fretboard. By using video as the primary teaching mode, we’re giving you a "live teacher” with a conversational tone to make your learning process more comfortable and - perhaps - fun! We hope that you will soon feel more confident reading and locating new chords on the 12 frets of your guitar. Kent Cole is a seasoned guitar player. His wife, Diana, is a novice. 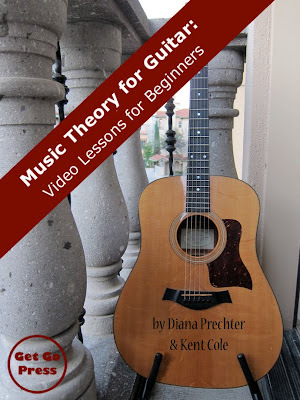 Diana's role is to try to keep Kent's lessons in "Music Theory for Guitar: Video Lessons for Beginners" simple, sequential, and understandable. Together they take a "just enough" approach by presenting just enough music theory to help guitar players continue to move into new territory. Learn basics about notes in the Western 12-tone scale, sharps and flats, up and down the fretboard, the location of the natural notes on the fretboard, and the octave. This chapter introduces the major scale's interval pattern: W, W, H, W, W, W, H (whole-whole-half-whole-whole-whole-half). In this section you will learn a convenient shorthand for describing the 7 notes in any scale using the numbers I, II, III, IV, V, VI, VII. 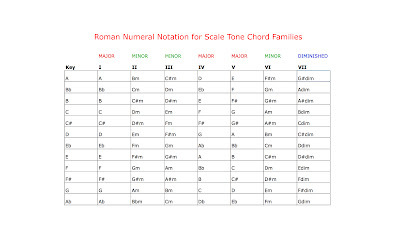 The other 5 notes have their own unique relative Roman numeral names, as we will show you. Switching it up! 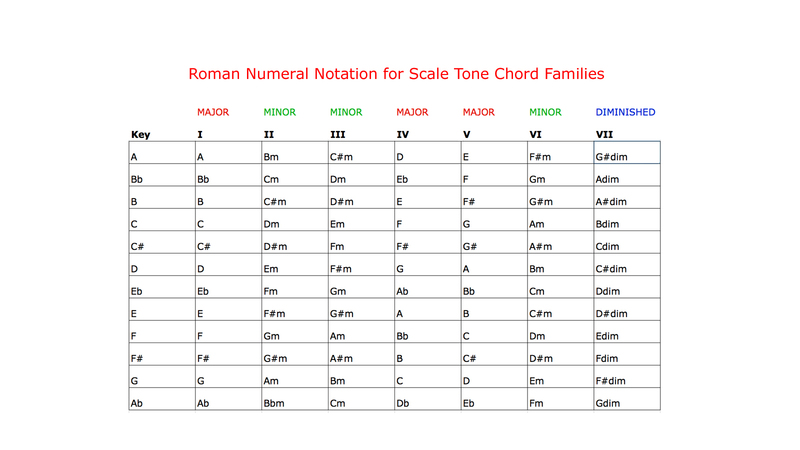 Now that you know how to find the notes in the major scale and their Roman numeral notations, we will practice the natural minor scale using W, H, W, W, H, W, W (whole-half-whole-whole-half-whole-whole). Major, minor, roots, keys, Roman numerals and more! We offer you working definitions of terms that you'll need to know to get your guitar music theory off the ground. We start with a few basic major chord shapes on the guitar fretboard. We’ll show you the I (or root), the III (Major Third) and the V (Perfect Fifth). Then you will see how to flatten the III (Major Third) to the iii (Minor Third) to form the minor chord. Putting it all together! After a quick review of basic terms and ideas, we present some examples of various chords (G, C, A, D, Cm) and offer you a visual reference for finding the “nearby notes” -- those that help to create chords that are more complex and melodic. Have you ever wondered what is meant when a musician says something like “key of C, I-IV-V?” This chapter shows you the formal structure of scale tone chords. You can know the I-IV-V of a song and begin to transpose songs to other keys. For iPad users, you can download the book inside the iBookstore. You can read the book in your iBooks app for iPad. Questions? You can reach us by leaving a comment at www.GetGoPress.com. All comments are moderated before publishing. If you leave us your email address, we will contact you privately without publishing.